To be completely honest, I do not love exercise. I’m not particularly a fan of getting up in the dark and heading to spin class before work or spending an hour at the gym at the end of the day. So why do I do it? Not only can exercise (or any movement such as dancing, walking or karate) help us maintain a healthy weight, but it can also help improve mental health and mood, decrease stress, and prevent the onset of chronic diseases such as heart disease. What we eat before and after exercise is crucial to getting the most out of each sweat-pouring, heart-pumping minute of our workout. Focus on carbohydrates: carbohydrates are the body’s primary source of energy, making it an important nutrient for proper fueling before exercise. Whole grains such as brown rice, oats, whole wheat bread or fresh fruits and vegetables are nutrient-rich sources of carbohydrates. Avoid fats: fats digest slowly in the body and can leave us feeling sluggish during a workout. Whole milk dairy products (yogurts, cream cheese, butter), nuts and nut butters, red meat (particularly bacon and sausage) and avocado are examples of higher fat foods. 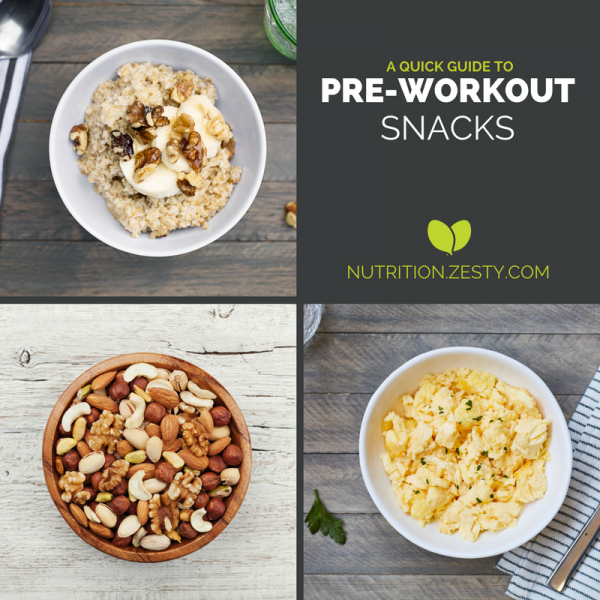 The best time to refuel post-workout is right away! 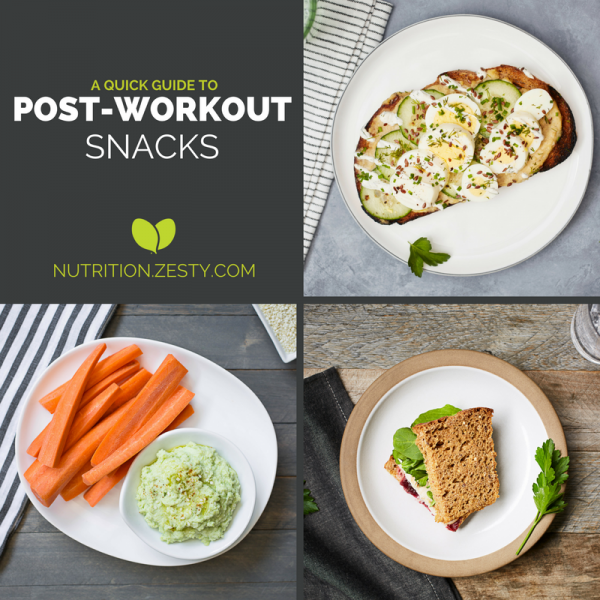 Eating a carbohydrate and protein-rich snack right after a workout helps replenish energy stores that were used up during the workout, according to the American Council on Exercise. Combine carbohydrate and protein-rich foods: carbohydrates, the primary source of energy for the body, help replenish and restore energy stores, while protein helps muscles rebuild. Eating within 30-60 minutes post-workout ensures that your body will recover as quickly and efficiently as possible. Also, waiting too long to eat post-workout can leave us feeling ravenous (read: “hangry”) and more susceptible to overeating throughout the day. As a dietitian at Zesty, San Francisco’s lead catering company, I always take advantage of our healthy office snack options for my pre- and post-workout fueling. Before heading into work, I grab a banana for a quick energy boost before spin class. Afterwards, my favorite office snack is plain Greek yogurt with sliced apple, cinnamon and a scoop of natural peanut butter. To continue fueling my body throughout the day, I fill half my plate with colorful vegetables provided during our office lunch. I’ve definitely felt the benefits of proper fueling for my workouts – most notably a boost in energy! What’s your tried-and-true workout fuel?